"I've got a girlfriend out of the city. 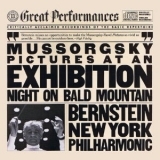 I know I like her, I think she is pretty"
Mussorgsky: Pictures At An Exhibition; Night On Bald Mountain (this album) (compilation) (1990). Sorry, no matches on eBay for "Pictures at an Exhibition: Promenade. Tranquillo New York".